Seeking LEED Platinum Net Zero Energy, this CSU project is designed with several passive and active strategies to reduce energy use, maximize daylight access, and improve indoor environmental quality. With the mild Long Beach climate, classroom program, and limited budget, Atelier Ten recommended passive strategies to play a large role in achieving this project’s energy conservation goals. The project places circulation and temporary gathering spaces outdoors, reducing the amount of conditioned space by 25% when compared to a conventional building. The building massing enables dual-sided natural ventilation and daylight, reducing the need for active cooling making the project more resilient. Atelier Ten developed a daylight approach to rely on exterior shading to control glare, improve comfort, and reduce cooling energy. 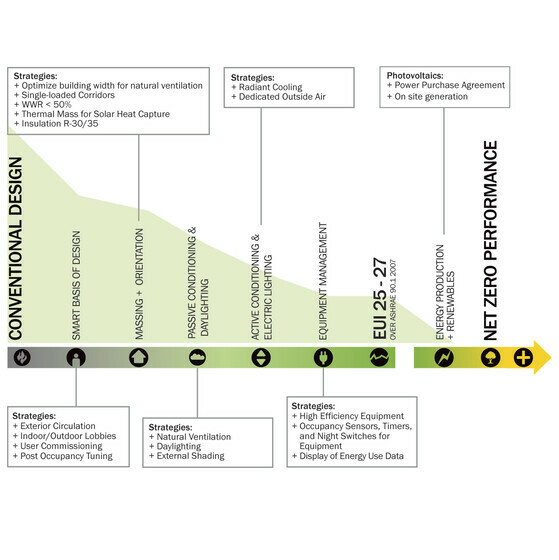 The project is designed to an EUI of 22 kBTU/SF/yr, under the original target, and with on-site PV to reach net zero.